300 item(s) available at last update. This paper is also known by some as Metallic Antique Ice Silver. Great selling premium metallic off white paper with very subtle silver shimmer - double sided colour. This is one of the very few metallic paper ranges suitable for inkjet, bubble-jet and laser printers*. As a result it is the most widely used paper range for DIY wedding invitations and projects as most household and standard office printers that accept heavy weight paper will produce beautiful results. 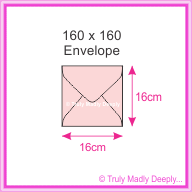 Our 160x160mm square envelopes measure 160mm x 160mm or 16x16cm. Our 160x160mm square envelopes hold our 150x150mm Square Pockets, 150x151mm Square Pocket Folds / Pouches, 14.85cm Square Scored Cards & our 14.85cm Square Flat Cards. This 160x160mm Square envelope has a Banker Flap (triangle) and to close simply moisten (wipe with damp sponge or lick) and seal. We also carry this colour envelope in the following sizes : 11B, C6, C5, DL, 5x7 or 130x185mm, 130x130mm square as well as sheets of paper & card, boxes and a wide range of die cut DIY invitation cards. Made from Genuine Curious Metallics paper from the UK - not a cheap Chinese copy. Dear Maria, .....Thank you so much for such great speedy service we really appreciate it! All the best.